Senate Democrats Monday announced that they will hold an all-night debate, which The Hill is describing as a “talkathon,” to attempt to stop the confirmation of Betsy DeVos, President Trump’s nominee for Education secretary. In a statement from the Senate floor, Senator Patty Murray said that “Democrats will hold the floor for the next 24 hours, until the final vote, to do everything we can to persuade just one more Republican to join us.” A final vote for DeVos is scheduled for Tuesday afternoon and Democrats plan to hold the floor until that time. Currently, only two Republicans have announced that they will not support DeVos; both Lisa Murkowski (Alaska) and Susan Collins (Maine) said that they will vote against her. Murkowski and Collins’s announcement led some to believe that DeVos, who is incredibly and completely unqualified to hold this position, was vulnerable. 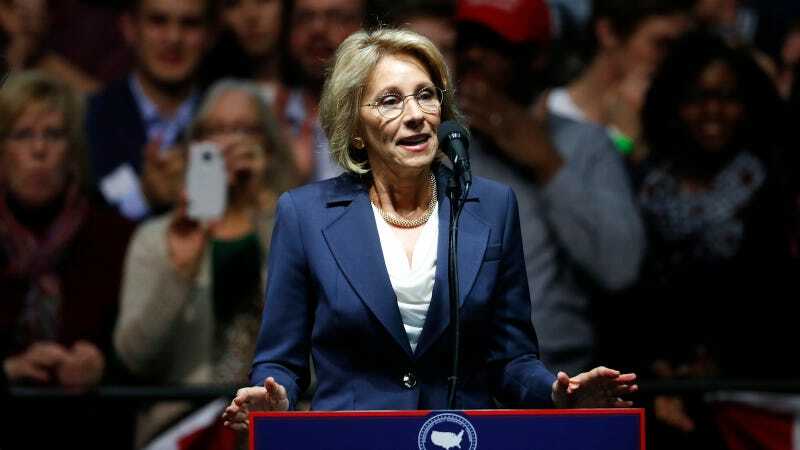 But unless Democrats can persuade one more Republican to break from their party line, then DeVos will likely be confirmed on Tuesday in a 50-50 vote with Mike Pence casting the definitive tiebreaker vote. Democrats’ all-night debate is not a filibuster, which is a tactic that seeks to delay or block a vote. Instead, it is an attempt to call more public attention to the vote, and increase public pressure on GOP senators who have already received tens of thousands of calls and emails from people who oppose DeVos. Senators Bob Casey (Pennsylvania) and Brian Schatz (Hawaii) both confirmed that they were scheduled to speak tonight. In the meantime, Betsy DeVos remains uniquely unqualified to be the Education secretary, Republicans remain completely spineless, and Democrats remain powerless.